(Atlanta, GA) January 31, 2019 – IronCAD, the premier 3D CAD program for machine designers and manufacturers, officially announces the release of the newest version of IronCAD Mechanical (IC Mechanical 2019), the ground-breaking Utilities Catalog for Fabricators within IronCAD’s comprehensive design extensions suite. Designed to support IronCAD’s effortless drag-and-drop capabilities, IronCAD Mechanical 2019 is now equipped with more extensive revision capabilities, enhanced steel profile cutting and extension functionality, and improved parts and material modification tools. 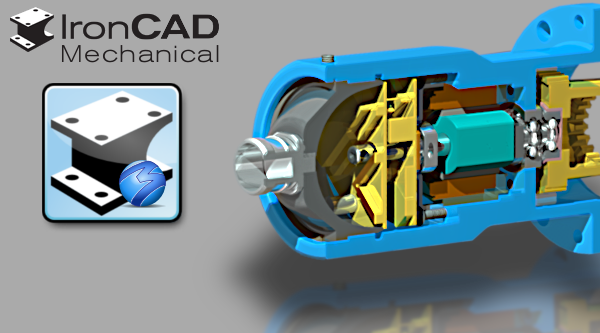 For IC Mechanical 2019, we have implemented a myriad of new time-saving features fashioned specifically for CAD designers and fabricators. The brand new tool, Revision Manager, allows IronCAD users to arrange and review the revision of the parts and assemblies located within their current 3D design scenes. The addition of new Isolate Element and Set Transparency commands permit more effective management of hidden parts and assembly part transparency statuses within a fabrication design, further proving Mechanical’s ability to make designers more efficient during the assembly modification stages. Further adhering to its tradition of innovation, IC Mechanical 2019 has increasingly refined its current functions and features, instituting an array of upgraded piping commands, which incorporate the capabilities to place piping along selected 3D pipes, insert elements along the length of previously designed tubing, and change the size and thickness of tubes within an assembly in seconds. Additional Zoom and Panning features within the one-of-a-kind IPRO CAD Viewer now grant users an even more holistic view of their designs, further allowing them to change the colors of their design elements as well as the background stage in which assembly takes place. Supplementary utilities focus around fabricators’ material management, empowering designers to now edit their material files and define different materials for each type of Custom Steel within the program as well as set material defaults as they see fit. Try 2019 Mechanical now for free by navigating to https://www.ironcad.com/free-online-trial/ to start your free IronCAD online trial, which includes the latest version of Mechanical.